Where did I get it? I bought it on Kindle way back in February and had mostly like forgotten about it, but my friend Stacey read it while she was on holiday and said I should read it, so I did. What's it about? Set in 1996, Sam's brother Charlie is infamous. The novel starts at the end of the summer, around the beginning of September. 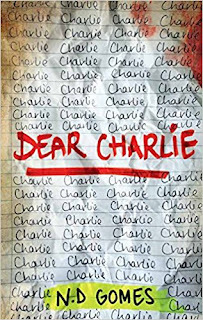 In June, Charlie walked into his and Sam's school in Pembrook with a gun and killed fourteen pupils and teachers, before killing himself. Sam's family is falling apart without Charlie. Sam doesn't know who his brother was or what part he played in Charlie's actions. Their parents blame themselves and each other and are fighting constantly. Sam's life is in pieces; outside, the paparazzi won't leave the family alone and they're ostracised when they leave the house. Sam has to go to a different school after being told he was no longer welcome at Pembrook. He starts at Knightsbridge, where people soon make him unwelcome. But he finds friends too, including Dougie, who he thinks is cool, and Izzy, who he has a crush on. 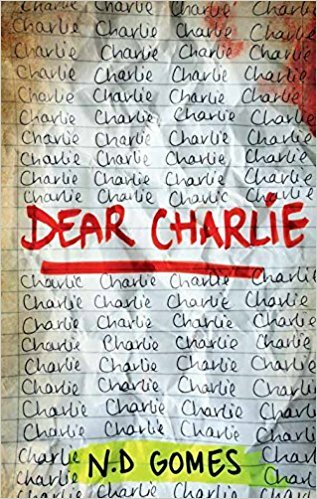 He writes letters to Charlie as part of the therapy he is undergoing, hence the title of the novel. I didn't love this book, although I read it quickly. I felt like Sam was mostly a sympathetic character, although I felt there were parts where he was quite nasty, for example when he commented on the looks of the girls he was hanging out with. It didn't fit with the tone of the rest of the novel and I found it quite jarring. Also, as a reader, I wanted more exploration into Charlie and his actions. As an adult I can see that not expanding on this makes sense, as a careful author wouldn't want to glamorise what he did. But as a reader, I wanted more! I also felt like time tripped in places, and moved on too quickly, whereas in other places things kept getting repeated. I'm sure there would be a lot of repetition from family members in a case like this, but it's not that interesting to read. I was also quite confused about where this book was set. I was expecting it to be American, but it clearly wasn't, but I wasn't sure where in Britain it was set, except that London was "down south". I'm leaning towards Scotland, but I wish the novel had been clearer. But in all, this is an okay book and I'd pick up something by the same author. Are any main characters people of colour? No, not that it was mentioned. Are any main characters disabled either mentally or physically? Charlie has a mental illness, of course, but it's not explored in much depth or detail. I don't think any trigger warnings would apply. Are there swear words? Not many at all. What criticisms do I have? I think I've outlined them above. I didn't know why the book was set in 1996, except that in 1996 the Dunblane massacre happened, which changed handgun law here in the UK and which remains one of the deadliest shootings here. In this book, Charlie's actions are used as the vehicle for a change in law. I also felt like some people could have tried to understand Sam's point of view more, including his parents. He's clearly been through something really traumatic, but no one except his therapist seems to care. I don't really understand pupils reacting badly to him at his new school - it's not his fault! I thought it was a bit odd. Each chapter starts with the name of a different song from 1996 and 1997 and as a 90s indie kid myself I liked this part of it, I'd love to listen to a playlist of all the songs! It wasn't always clear if they were relevant to the text though. Would I recommend the book? Kind of? I didn't love it but it's not a bad book. Why did I choose to read it at this point in life? As I said, Stacey had recommended it - I think she liked it more than I did! What other books is it like? The parallels with the Columbine massacre made me think of the book She Said Yes, which is about one of the victims there. It also reminded me a lot of Perks of Being A Wallflower, although I'm not sure why!